In the winter of 2009, students Kyle and Brandon Persaud met an orphan boy named Jason on a family trip to Guyana, whose story made a strong impact on their lives. During this trip, the Persaud’s delivered healthcare goods and educational items to an orphanage in the Guyanese town of Berbice and had an opportunity to spend time with the orphaned children. After speaking with Jason and hearing about his hardships, the Persaud boys realized these impoverished communities desperately need a helping hand. It was through this inspiration that KB Operation Hope was formed. 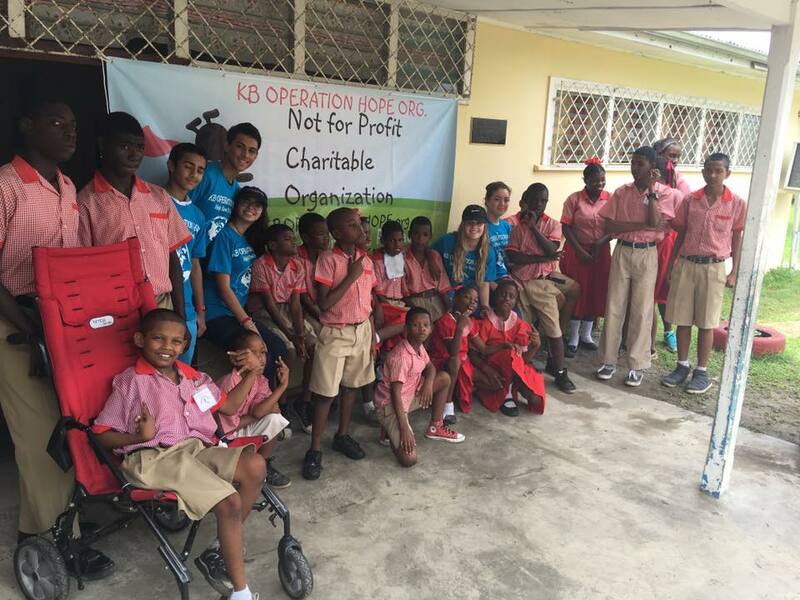 With the mission of providing over the counter medical necessities, educational supplies, and advocacy for poverty-stricken children and children whose lives have fallen into peril due to natural disasters, the Persaud’s organized and registered the not-for-profit organization, KB Operation Hope. This organization maintains the firm belief that children are the future; and with proper care, resources, and attention, they will ensure a greater future for all. This belief system is the guiding force which drives the Persaud boys to collect donations, organize campaigns within schools and communities in the US, and host collection drives, which will help empower the lives of young individuals who are struggling on a daily basis. Students bring school supplies to impoverished and indigenous schools. This “Break the Silence” sign was on display at the Minister of Social Protection’s office. 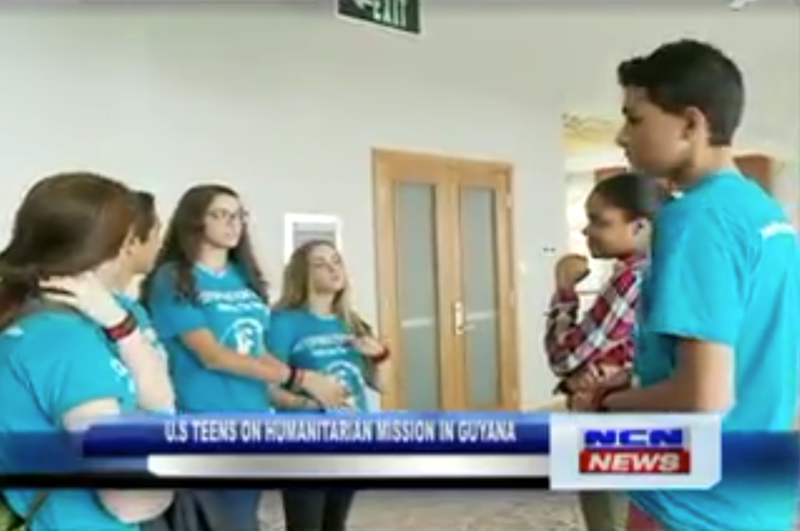 With the motive of giving back, KB Operation Hope brought five students-ambassadors from The Knox School to Guyana, in an effort to distribute collected goods, advocate for children to governmental agencies and more. Students Kyle and Brandon Persaud, Hannah Bogart, Hailey Schwartz, and Silvia Hernandez-Benito traveled to Guyana in late January, for a week-long charitable tour. On their trip, they visited several orphanages, met with the Minister of Social Protection, the US Embassy, and other organizations who have signaled their intent to help their organization grow. On this recent trip, the student-ambassadors made plans with two organizations, an orphanage in Berbice, and the Kamal Home,to develop a room for teaching basic life skills to the orphaned children, so that these children may have brighter, more independent futures. They also solidified an agreement with US Embassy officials to arrange for the goods sent by KB Operation Hope and other organizations, to be sent to indigenous communities and shelters. KB Operation Hope makes a monetary donation at St. Cuthberth’s indigenous village. Knox Student Ambassadors meet with Vice President and Minister Alicock. KB Operation Hope speaks about their cause to a reporter from NCN News Guyana. The faculty and Administration of The Knox School are so very proud of the selfless acts that have been performed by these generous and dedicated future leaders. Visit KB Operation Hope’s website at http://kboperationhope.org to learn more about their mission and goals, and consider making a charitable donation to help this amazing cause.